What kids are saying about the books they're reading. Some books make you laugh, some books make you cry, and some books make you laugh so hard you cry. 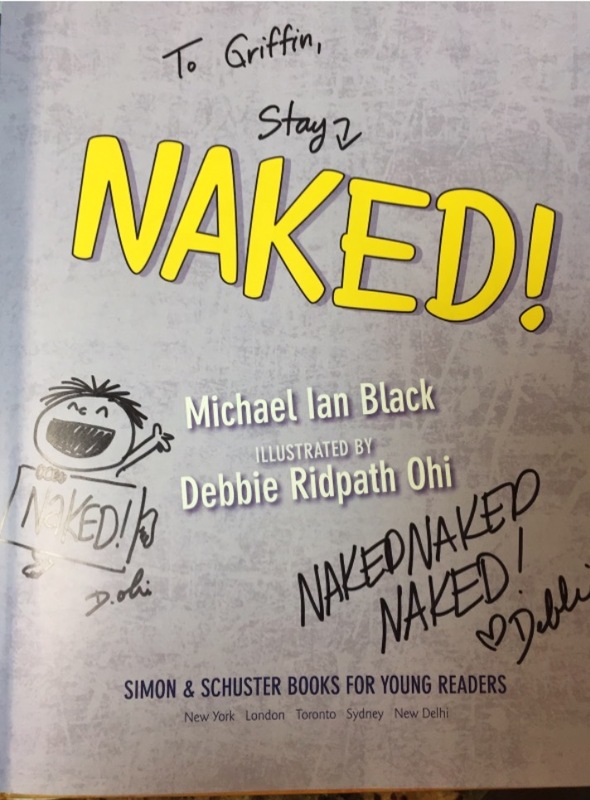 Naked, written by Michael Ian Black and illustrated by Debbie Ohi, is one of those special books that does both. 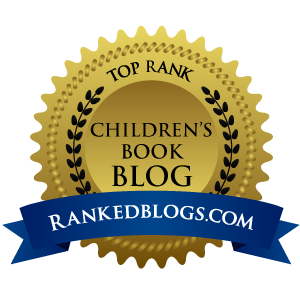 At first glance, it may seem strange to pick a light, comedic picture book for a blog post titled “The Power of the Picture Book.” After all, it doesn’t have the life-inspiring message of Oh, the Places You’ll Go! by Dr. Seuss or the historical significance of Martin’s Big Words by Doreen Rappaport. This book does, however, have a far more personal connection for me; it’s the first book my son, Griffin, fell in love with. Like most children, Griffin has always enjoyed listening to picture books. Even from a very young age, he would sit and listen to book after book. However, it wasn’t until I read Naked! to him one night that he truly become of lover of picture books. From page one, he was laughing hysterically. When it was finished, we were not allowed to move on to read the next book in the stack. “Again” became Griffin’s new favorite word. In fact, we didn’t go a single day for the next two months without reading Naked! multiple times. He would “read” the book to us, he would demand we read it to him, and yes, he would even act it out. As any parent of a little boy can tell you, there are two things they love: wearing a cape and running around naked. 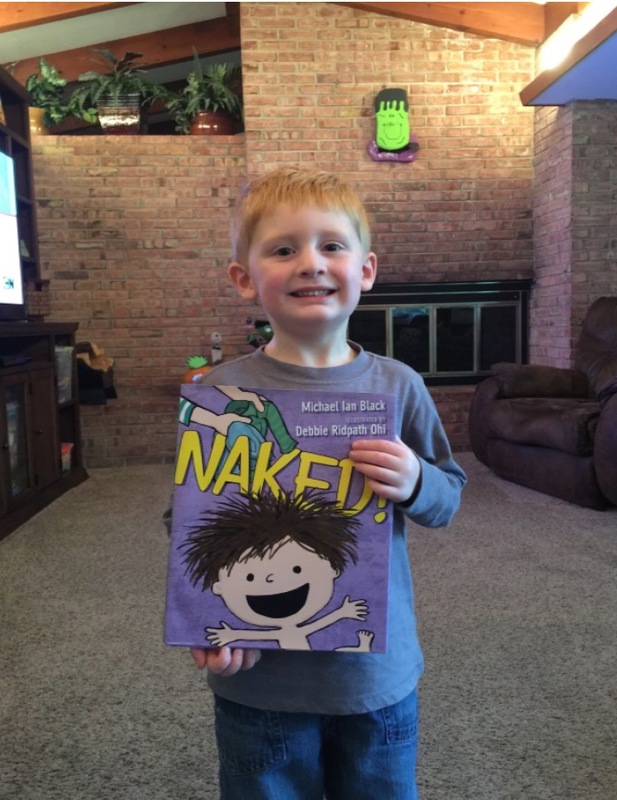 Over a year has passed since the first time I read Naked! aloud to Griffin and it is still his favorite book. It wasn’t until we read the book numerous times that I noticed Griffin wasn’t just laughing at a naked boy in a cape. He was picking up on an amazing amount of detail and craft from the story. He noticed the potato from I’m Bored by Debbie Ohi. He was mesmerized by the illustration of the boy running down the stairs. “Look at how fast he is going, Deda. He’s faster than the Flash,” were his exact words. He said he could tell the character was cold because of the “shaky lines” next to him. He realized the boy had his hands out “like Superman” when the mom carries him. He even noticed that this boy was like David (From No David! by David Shannon) because they were both naked at some point. He didn’t get bored hearing the story literally hundreds of times because he was constantly picking up new information. I took a picture of Griffin with the book for this article. The first thing he said after “cheese” was “can we read the book now?” He still laughed hysterically at every page and demanded to hear it again after we finished. Jim Bailey is the principal at Hemmeter Elementary in Saginaw, Michigan. He has a passion for helping all students become lifelong readers. Jim spends his time reading, cheering on the Detroit Tigers, and enjoying time with his family (wife, Laura, and two sons, Evan and Griffin). He is an all-around nerd who probably spends too much time obsessing over Game of Thrones, Star Wars, Clash of Clans, and comic books. You can follow him on Twitter @jcbailey3.